FRANKFURT, Germany – RCF has introduced two additions to its HDL composite range, with the announcement of the HDL 50-A 4K (pictured here, top) and HDL 26-A (pictured below). The HDL 50-A 4K active 3-way line array module is a higher-powered redesign for the original HDL 50-A, supercharged with 8000W peak power (4.0kW RMS). Equipped with 2 x 12” woofers, four symmetrical 6.5” midrange and two 2” drivers, it offers excellent playback quality and enhance the SPL up to 143dB, with onboard FiRPHASE and RDNet networked management. Using advanced neodymium magnets and a ground-breaking new housing constructed from lightweight plywood and polypropylene, the R&D department worked assiduously on all elements of design and componentry to achieve a remarkably low weight of just 56 kg. Current HDL 50-A’s owners can seamlessly upgrade the system to 4K by simply replacing the onboard amplifier. Just as they have seen the hugely popular HDL 30-A become a worldwide standard in the medium-format range, RCF is now positioning the new HDL 50-A 4K to do the same in the large-format category. A further advantage of the HDL 50-A 4K is that it comes with RDNet 3.1, which is dedicated to line array management, and thanks to this advanced software, it offers enhanced management, enabling control of every transducer, adjustment of humidity and temperature, bass shaping and many other attributes. 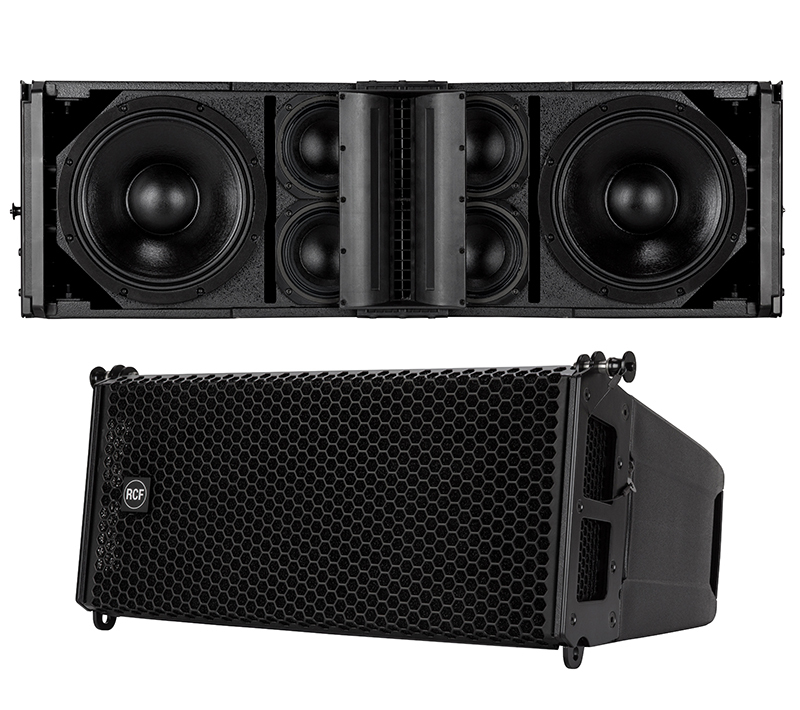 Occupying the same footprint as the HDL 6-A, RCF HDL26-A is an ultra-compact bi-amped two-way active touring system for small and medium-sized events, both indoors and outdoors. Because of the advanced transducers’ design and the 2000W Class-D amplifier—among the best in its class—it is capable of an extended bottom-end and a pristine sound for a wide range of applications, either alone or in a line-array configuration. In addition to the inherent power, RDNet and FiRPHASE are fitted as standard. Equipped with two 6” neodymium woofers, 2” voice coil and 1.4” titanium CD driver with 3” voice coil, aside from its impressive low end its design brief was to be best in class. On top of that it has an impressive low weight mass of just 13kg, making it ideal for the rental market and as a small installation system. The low-frequency flyable companion designed for the HDL 26-A is the high-performance 15” active flyable subwoofer HDL 35-AS, compatible with the HDL rigging system and the RDNet Networked Management.